"Joe Louis Almost Beaten by Wolcott"
These 15 minute shows, first broadcast to advertise Careers in the US Air Force during 1955, recall some of the great episodes in sports history. Included in the series are Lew Worsham winning the 1947 US Open over Sam Snead, Jessie Owens at the 1936 Olympics, Joe Louis nearly beaten by Joe Wolcott, the 1927 Indy 500 Race, the 1950 Football Championship game between the Rams and the Browns, and many others. There is a description of the circumstances surrounding the event, followed by a recreation of the event itself. Military History buffs will enjoy hearing the recruiting advertisements for the fledgling United States Air Force. 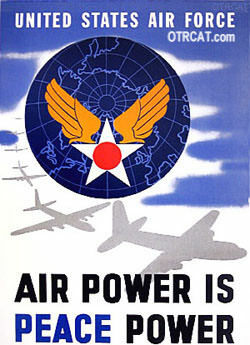 The Air Force became a separate military service in 1947. The mid 50's, as well as the being the early days of the Cold War, was also the infancy of the Jet Age. Young American men had a terrific opportunity to "Go Places" and receive valuable technical training in the Air Force. There was also a call for much needed experienced former service members to put their skills to use. See also: Don Drysdale Bullpen and Bill Stern's Sports Reel. Be the first to comment on "Big Moments in Sports"